How do I project two images simultaneously? You can use the split screen feature to simultaneously project two images from different image sources next to each other. 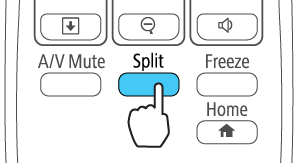 You can control the split screen feature using the remote control or the projector menus. 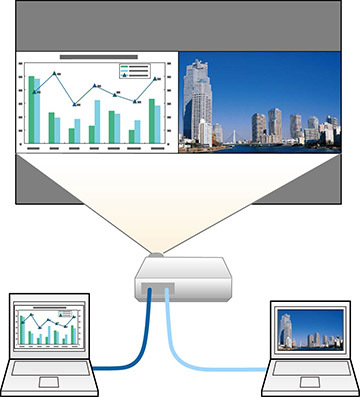 Note: While you use the split screen feature, other projector features may not be available and some settings may be automatically applied to both images. Press the Split button on the remote control. The currently selected input source moves to the left side of the screen. To switch the images, select the Swap Screens setting and press Enter. To change the image sizes, select the Screen Size setting, press Enter, select a sizing option, press Enter, and press Menu to exit. Note: Depending on the video input signals, the images may not appear at the same size even if you choose the Equal setting. To choose the audio you want to hear, select the Audio Source setting, press Enter, select an audio option, press Enter, and press Menu to exit. 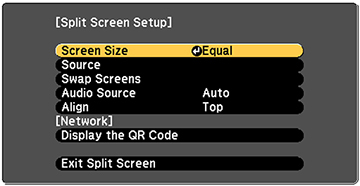 Note: Select Auto to hear audio from the largest screen or the left screen. To exit the split screen feature, press the Split or Esc button. Published: Jan 16, 2017 Was this helpful​? Thank you for the feedback!